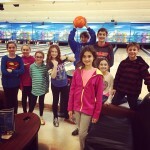 Lifelong friendships form here as friends come together in meaningful Jewish activities. Whether it’s baking cookies for MANNA clients, stocking the shelves at the JFS Food Bank or collecting socks and toiletries for the homeless, these students practice social action and Tikkun Olam, making the world a better place. They also have plenty of fun—from bowling parties to movie nights to the Ocean City Boardwalk Food Tour, and more. There’s a group for every age level starting in fourth grade. 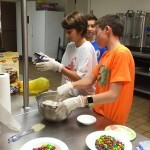 Each year, BITY composes and leads the annual Youth Service, a creative Reform camp-style service for Shabbat. 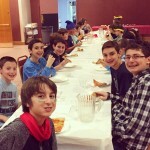 In addition, youth group members volunteer at events, and are a significant part of the annual Purim Carnival. 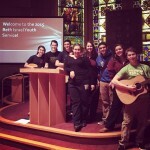 BITY is a member of the North American Federation of Temple Youth or NFTY. The regional group of youth groups meets five times a year at URJ Camp Harlam in the Poconos and also at locations throughout the region. The Harris Fund offers stipends for students interested in attending these retreats, which enrich the students’ Jewish identity and experience. 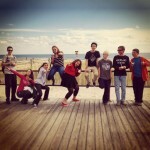 The Sisterhood offers stipends for students to attend NFTY Summer Programs in Europe and Israel. Contact Youth Group Advisor Susan Weis at the synagogue office at (609) 641-3600 or at bethisrael@cbinorthfield.org.